It's Friday lovebugs. Here are my favorite recipes this week. Combine pomegranate and cranberry juice, vodka, Cointreau, club soda, lemon juice, and simple syrup in a punch bowl. 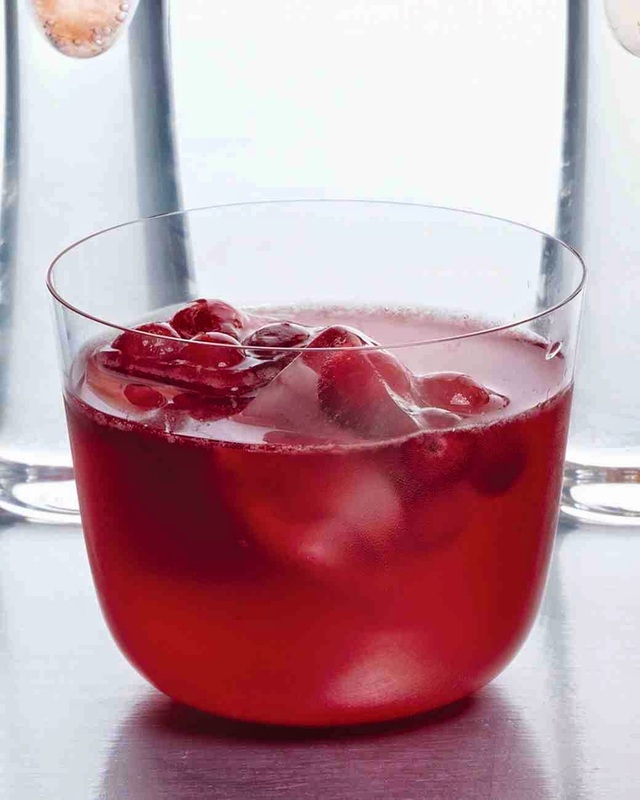 Fill glasses with cranberries frozen in ice cubes, and serve. Garnish with lemon slices if desired. In a large frying pan heat the butter over moderately low heat. Season pork with salt and pepper. Raise heat to medium and add the chops to the pan and sauté for 7 minutes. Turn and cook until chops are browned and done to medium, about 7-8 minutes longer. Remove the chops and put in a warm spot. Add shallots to the pan and cook, stirring, until soft, about 3 minutes. Add the stock to deglaze the pan, stir in the mustard, 1 tbsp parsley, then add mushrooms, season with fresh pepper and cook about 3 minutes, or until mushrooms are done. 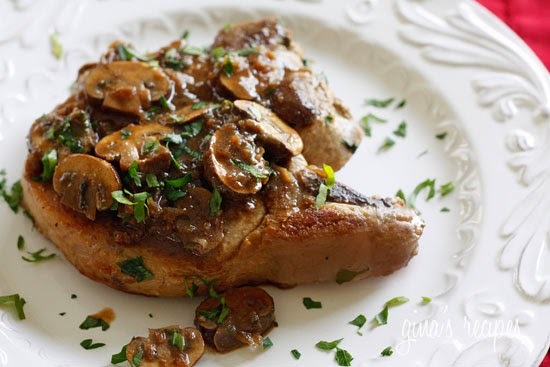 Put the chops on a platter and pour the mushroom sauce over the meat, top with remaining parsley. In a large mixing bowl, beat cake mix with JELL-O Chocolate Instant Pudding Mix, eggs, sour cream, oil, water and milk. Blend completely for about 2-3 minutes. 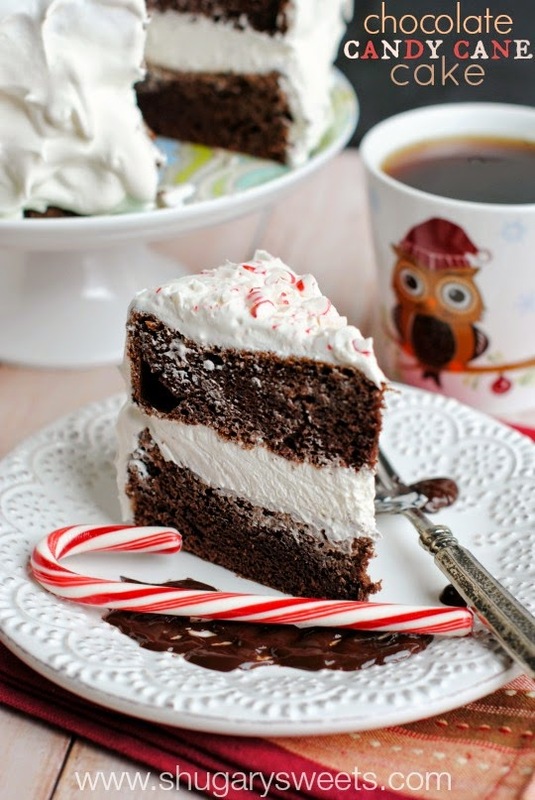 Fold in crushed candy canes and chopped chocolate. Spray two 9inch cake pans with baking spray. Line the bottom of the pan with parchment paper. Divide batter evenly into the pans. Bake for 35-40 minutes and allow to cool about 5 minutes in the pan. Loosen cake from the sides and invert onto wire racks. Cool cakes COMPLETELY before frosting. We chilled our cake layers in the refrigerator for about an hour. For the ganache, combine the chocolate with the heavy cream in a small glass bowl. Microwave for 30 seconds, stir and heat an additional 30 seconds. Whisk until smooth. Place bottom layer of cake on cake plate. Top with melted ganache. Allow to cool slightly before adding COOL WHIP. Spread 3/4 of one container on top of ganache. Top with second layer of cake. Using the remaining COOL WHIP (from the first container and the second), spread evenly over top and sides of cake. Sprinkle with crushed candy canes for garnish.